Ours is a caring and mission-oriented congregation located in the downtown area of beautiful, historic Thomaston. Our congregation is called “Federated” because it is made up of both United Church of Christ and United Methodist Church members, as well as those from other faith traditions. These two denominations have been together since 1927. The congregation is social, outgoing, and generous in its concern and care for one another. Our members are very active and involved in both our own church’s outreach efforts and those of the larger community. All are welcome! Examples of our church’s diverse outreach endeavors include sponsoring a Cub Scout and a Boy Scout Troop, conducting cooking classes in our local school, putting on our annual Church Fair, supporting the Thomaston Food Pantry, sponsoring a community-wide “Feed the Hungry Walk”, assembling Church World Service kits, and delivering home-made cookies to shut-ins. The church building, which is located on Hyler Street just a block over from Main Street/Route 1, was built in 1857 and is a lovely example of Victorian architecture. It is handicapped-accessible. The sanctuary is graced with glorious stained glass windows and has an excellent organ as well as a baby grand piano for music. Henry Knox, the country’s first Secretary of Defense under George Washington. Thomaston is situated on U.S. Route 1, the main coastal artery that runs the length of the coast of Maine. 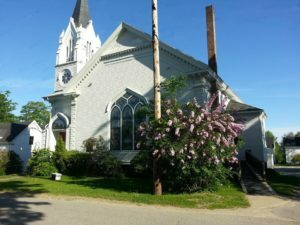 For several small towns on the nearby peninsulas, Thomaston is the first town with a variety of economic and social opportunities. In addition to Montpelier (the General Knox mansion) and the Thomaston Historical Society, there is an active public library, several restaurants and retail establishments, antique and art galleries, marine businesses and several churches, most within walking distance from downtown. Various cultural events are hosted at the library, Watts Hall and the schools. The Farnsworth Art Museum and the Strand Theater as well as additional galleries, restaurants and boutiques are available in nearby Rockland. The PenBay Medical Center, our local hospital, delivers excellent medical care and has just been rated one of 67 top hospitals in the United States! Our mid-coast location jumps into high gear from spring to fall, with numerous special events such as the Camden Film Festival, the Atlantic Blues Festival, the Friendship Sloop races and the Rockland Lobster Festival, to name just a few. Thomaston’s Fourth of July celebration, featuring one of the state’s largest parades as well as activities all day long culminating in a major fireworks display, is a high point of the summer and draws thousands of spectators. The Owls Head Transportation Museum also hosts several weekend events featuring vintage motors, cars, planes and specialty vehicles. All this is in addition to the wonderful opportunities for boating, sailing, fishing, biking, skiing, camping and more for which mid-coast Maine is known.